For families, eating right has become a monumental challenge. Cultural messages convince us that we no longer have time to cook, and food marketers spend billions persuading us that packaged, processed food is convenient, satisfying . . . and the key to happiness. Half of all our meals are now eaten outside the home. The result? Skyrocketing rates of heart disease and diabetes and unprecedented levels of childhood obesity. This crisis is movingly portrayed in author and activist Laurie David's new documentary (coexecutive produced with Katie Couric), Fed Up! Luckily, we have a solution: Studies have clearly shown that eating home-cooked meals reduces obesity and develops lifelong healthy eating habits. There is an exciting movement afoot that involves a skillet, a few good knives, and some fresh ingredients: Home cooking is making a comeback. In The Family Cooks, David inspires parents and kids to take control of what they eat by making it themselves. With her longtime collaborator, Kirstin Uhrenholdt, David offers more than 100 recipes that are simple, fast, "low in the bad stuff and high in the good stuff," and designed to bring kids into the cooking process. The authors also demystify cooking terms and break down basic prep techniques, creating stress-free meals that foster health, togetherness, and happy palates. 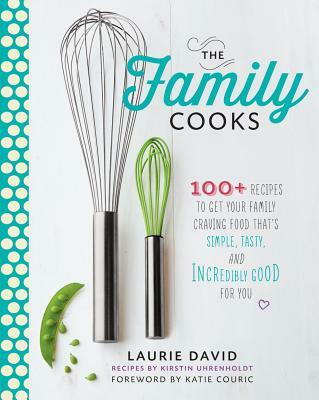 The Family Cooks is the ideal companion for unseasoned chefs of all stripes, whether they're parenting or being parented. Laurie David is the producer of the new documentary Fed Up! and produced the 2006 Academy Award–winning documentary An Inconvenient Truth. She is also the author of the bestselling Stop Global Warming and of The Family Dinner. The recipient of numerous honors, including the Producers Guild of America's Stanley Kramer Award, a Humanitas Prize Special Award, Glamour's Woman of the Year, and the Audubon Society's Rachel Carson Award, David has been featured on Oprah, Good Morning America, The Today Show, CNN, Fox News, and MSNBC.